We are a leading Wholesale Trader of electromagnetic field tester and lutron emf-822a electromagnetic field tester from Mumbai, India. We are a noted manufacturer and supplier of Electromagnetic Field Tester. A tester is used for measuring contaminant level in a water, defects in electrical wire, circuits functions of musical equipment, leakages in gas pipes etc. 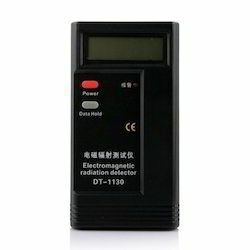 An electromagnetic Field Tester is used to measure the electromagnetic field radiation produced in Electric Cables, TV Monitors, Digital muisc players and many more. Torque meter model no.tq-8800 lutron taiwan make 15kg-cm professional torque meter with 15 kg-cm torque probe, full set, 0.6" lcd display, measurement : torque value, peak hold, data hold, max & min value, 3 kinds of display unit : kg-cm, lb-inch, newton-cm, sensor : exclusive torque sensor sensor type select : accept 3 type torque probes (15kg-cm, 50kg-cm & 100kg-cm) change probe, new calibration are not neccessary. 15kg-cm probe is the standard accessory. The EMF tester is designed to provide user a quick, reliable and easy way to measure electromagnetic field radiation levels around power lines, home appliances and industrial devices.The EMF tester is a cost effective, hand-held instrument designed and calibrated to measure electromagnetic field radiation at different bandwidths down to 50Hz/60Hz. 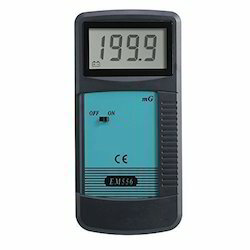 This EMF tester is specifically designed to determine the magnitude of electromagnetic field radiation generated by power lines, computer's monitor, TV sets, video machinery and many other similar devices. Electromagnetic field tester with Separate Probe Model No.EMF-827 LUTRON TAIWAN Make 3 1/2 Digit LCD Display, Range : 20 / 200 / 2000 micro Tesla, 200 / 2000 / 20000 micro milli-Gauss Accuracy : (23 + 5ºC), Sampling Time : Approx 0.4 sec, Battery : 9V DC Battery, Power Current : Approx DC 2mA, Weight : 215g/0.48LB (Including Battery), Dimension : Instr : 163x68x24mm Probe : 175x45x22mm. 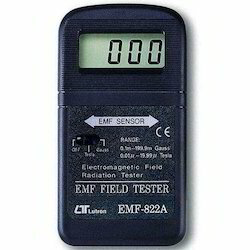 This EMF tester is specifically designed to determine the magnitude of electromagnetic Field radiation generated by power lines, computer's monitor, TV sets, Video machin ery & many other Similar devices.